To prove the ROI of your marketing activities, you need a sound marketing attribution model. Which model should you choose for your agency? This guide will explore the science of measuring marketing attribution and how to pick the right model. With most marketing campaigns – online or offline – it is never clear enough which channel or creative led to a conversion. You might be able to calculate the ROI of a PPC campaign, but how do you quantify the impact of a top-of-the-funnel content or social media campaign? If you’re an agency marketer, questions like these keep you up at night. You want to show ROI to clients, but without proper attribution, you can never truly quantify your results. In fact, 43% of marketers in a HubSpot survey even said that proving ROI of marketing activities was their biggest challenge. I’ll drill down into the science of measuring marketing attribution in this post. I’ll share the different approaches to marketing attribution and show you a process for doing it for your campaigns. 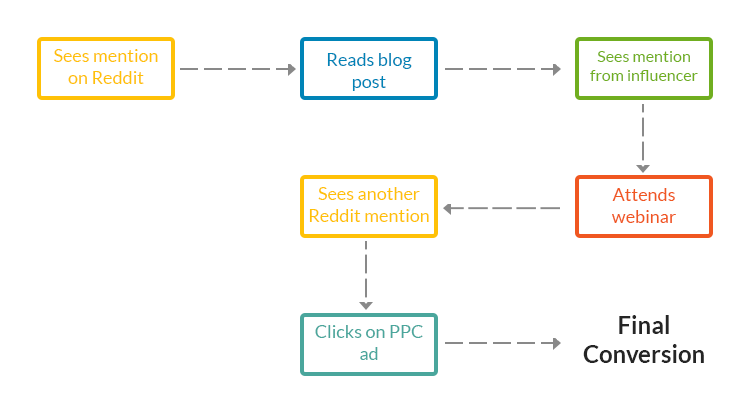 Picture this customer journey: a customer first learns about your company when he sees a mention on Reddit. He makes a mental note of the product and clicks away to another site. A week later, he comes across a tweet featuring your product shared by an influencer he trusts. This time, he explores your site a bit more, even taking a short product tour. His third encounter is when he searches for your target keyword and sees an ad on Google. Since he doesn’t buy the product right away, you add him to your remarketing list. Over the next several weeks, he sees your remarketed ads all across the internet. Finally convinced, he decides to buy your product, ending a month-long customer journey. Who should get the credit for this sale? The content marketing campaign on Reddit that first introduced him to the product? The influencer marketing campaign that added credibility to your offer? Or the AdWords campaign that helped you start the remarketing campaign? The easy option would be to just attribute it to the final campaign right before conversion (i.e. last-touch attribution). But this underplays the intangible impact content and social validation have on purchase decisions. Can you say for sure that the customer would have converted if he hadn’t read your company blog post on Reddit or seen the influencer endorsement? The increasingly complex nature of customer journeys demands detailed marketing attribution. It’s not enough to know the last step that led to conversion. You also need to know every single touch point that led to the conversion. As the graph below shows, most industries require several touchpoints before turning a prospect into a customer. Customer insight: Since marketing attribution looks at every touchpoint preceding the conversion event, it helps you understand customers better. You get insight into your customers’ preferred channels, conversion paths, and even their choice in creatives. Customer value: Marketing attribution helps you understand the value of each new customer vis-a-vis the cost to acquire them. This can help you zero-in on your most profitable customers and marketing campaigns. Quantifiable ROI: Marketing attribution helps you assign a fixed value to each part of the customer acquisition process. This makes it much easier to prove ROI. Perhaps most importantly, marketing attribution improves the effectiveness of your campaigns. It tells you where to advertise, how frequently to run each campaign, and what’s the optimum number of interactions necessary to land a sale. Time lag to conversion, i.e. the time between first interaction and final conversion. This can help you stop a campaign from running for too long/short. Optimum frequency, i.e. the number of interactions or impressions necessary to land a conversion. This can help you fix your campaigns to run the optimum number of times. Channel influence, i.e the impact top-of-the-funnel channels had on conversions. Traditional marketing often ignores these channels in favor of last-touch attribution. Below, I’ll share a few key attribution models you can use in your marketing campaigns. One of the biggest problems in marketing attribution is choosing a model that fits your needs. Models that are easy to implement tend to over-emphasize particular campaigns. More complex models lead to more accurate attribution, but can be harder to implement. There’s also the fact that marketers want to use models that favor their marketing domain. 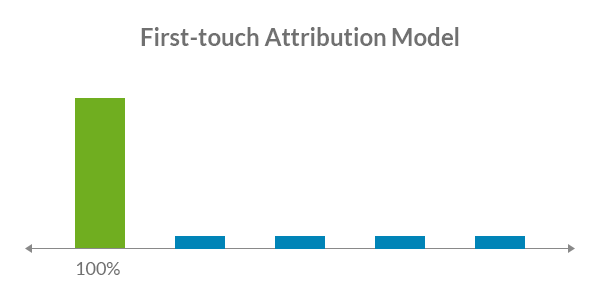 A content marketer would want to use first-touch attribution, while a PPC expert would favor last-touch attribution. Before we can solve this problem, let’s look at some of the most common marketing attribution models and their chief concerns. In this model, the first touch that leads to a conversion event gets 100% credit. All the subsequent touchpoints are ignored. For instance, if a prospect downloads an eBook on your blog and becomes a lead, the blogging campaign would get the attribution. The advantage of this model is that it is extremely easy to implement. You only have to track the first touchpoint where a prospect becomes a lead and assign it 100% credit. This works particularly well for top-of-the-funnel campaigns. Most tracking software (such as Google Analytics) have a 90-day cookie window, which is shorter than most B2B sales cycles. The first-touch model is usually favored by marketers who want to track the conversion path from “anonymous prospect” to “lead”. 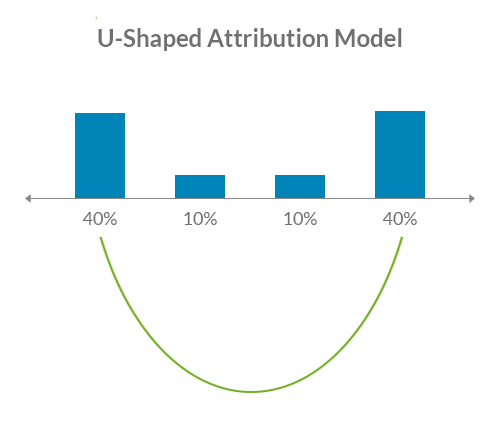 This is the most commonly used attribution model. Instead of the first touch, this model credits the sale to the last touchpoint before the conversion event. For instance, if a prospect downloads an eBook, attends a conference, and finally clicks on an AdWords ad to buy the product, the AdWords ad would get 100% of the credit. All the touchpoints before it would be ignored. If you’re focusing on a particular channel, you might also use “last [Channel]-touch” attribution, such as “last SEO-touch attribution”. With this approach, the last channel-related touchpoint gets 100% credit for the sale. As popular as this model is, it has some obvious issues. It ignores all the touchpoints that lead to the sale, even if they had a significantly bigger impact on conversion. Last-touch attribution ignores the consideration stage, placing all the credit to the decision stage of the buyer’s journey. 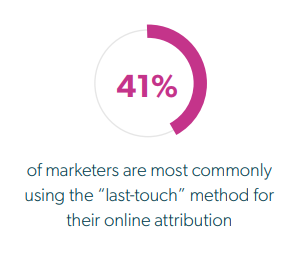 Despite these flaws, 41% of marketers use it as their most commonly used attribution model. The idea behind linear attribution is simple: every touchpoint gets equal credit for the conversion. Thus, if a prospect turned into a lead on your blog, clicked an email CTA, and attended a webinar before converting, each of these three touchpoints would get 1/3rd of the credit. Linear attribution is a step-up from the myopia of last-touch attribution, but it is still far from perfect. Touchpoints vary greatly in terms of their impact on the customer’s decision. A two-day, $2,000 conference has much more sway on a conversion than a short blog post. Yet, linear attribution treats both the same way. Moreover, linear attribution ignores the impact of “non-tangible” factors such as brand perception. It also doesn’t do a good job of measuring non-measurable initiatives such as a print campaign. 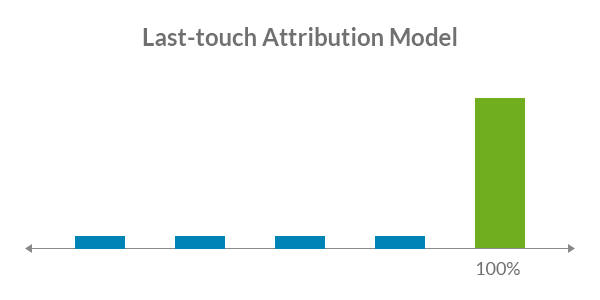 To its credit, linear attribution is the first step towards multi-touch attribution modeling. The time-decay attribution model assumes that touchpoints closer to the conversion event are more important, and thus, deserve more credit. The touchpoint immediately preceding a sale will get more credit than the one before it. 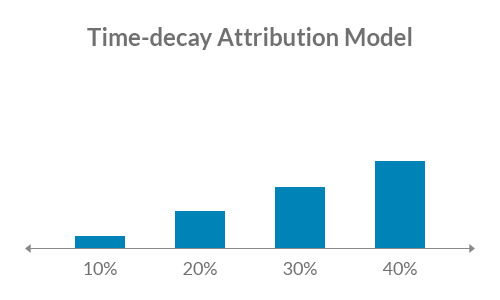 In Google Analytics, the time-decay attribution model has a half-life of 7 days. That is, a touchpoint 7 days before a conversion will get ½ the credit, a touchpoint 14 days before will get 1/4th the credit, and so on. This attribution model works best when you’re running a short promotion and want to prioritize activities immediately before the promotion event. For instance, you might promote your Black Friday offers in the weeks leading up to the event, but you’ll still want to give the highest credit to your offers on the day itself. By default, the 7 day half-life in Google Analytics is too short for long sales cycles. In a typical B2B cycle that lasts several months, early touchpoints get negligible credit. Like linear attribution, multi-touch attribution ignores the impact of brand equity and top-of-the-funnel campaigns (including offline campaigns). While these attribution models can work, they fail to capture the reality of modern marketing. 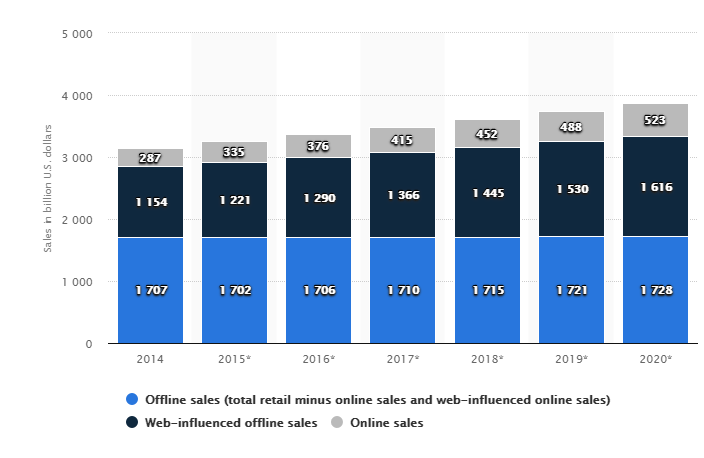 As this graph from MarketingLand shows, immeasurable factors such as brand equity, WOM, etc. have a big impact on purchase decisions. 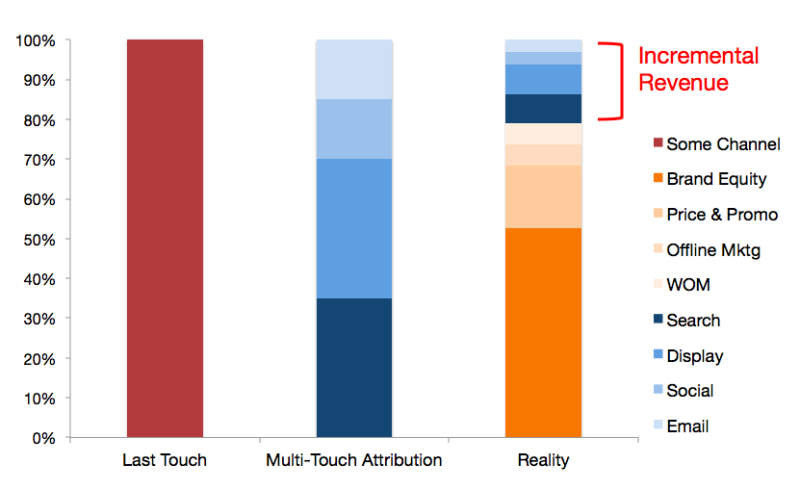 For truly accurate attribution, you need multi-touch attribution modeling. This is particularly true if you have long sales cycles with more complex products (as would be true for most agencies). In other words, you have to assume that whatever attribution model you use (or build on your own) will have some inherent flaws. Some things will get misattributed and some “data dark holes” (such as “direct” traffic) will always exist. How many people shop at a store after seeing an ad online? Conversely, how many people see a billboard for a service and lookup its website? If you’re running any sort of campaign with an offline component, these are questions you need answers to. This is particularly true for online-influenced sales – a roughly $1.5T market. 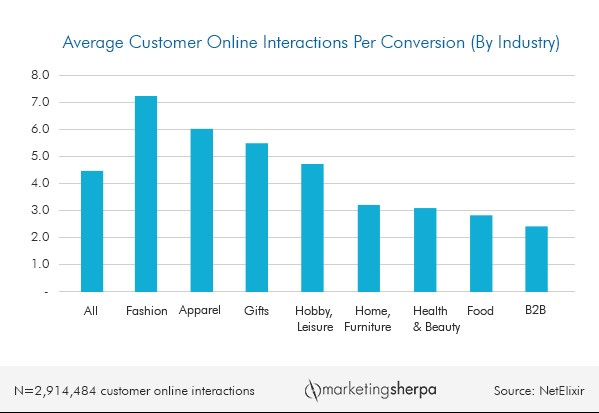 Unfortunately, most attribution models do a poor job of resolving the online-offline relationship. If the touchpoint itself was unmeasurable – such as a TV ad – how do you account for it in your attribution model? There are no clear solutions to this problem; you have to rely on workarounds. These can give you a rough picture of your marketing efforts – enough to understand what’s working, what’s not. Coupons: Use campaign-specific coupons that customers can redeem in-store. This will tell you which campaigns are turning into in-store visits. Store directions: Track the number of people clicking on the ‘Store Locator’ or ‘Driving Directions’ link on your website. For better data, ask for a zip code on these pages. Call tracking: Track the number of calls to measure performance. You can use campaign-specific phone numbers to track performance at a campaign level. Since the goal of most local businesses is to drive in-store visits, online-to-offline transactions are usually tracked using last-touch attribution model. That is, the final touchpoint that resulted in a store visit would get credit for the conversion. Tracking the impact of an offline campaign on website visits is much harder. The data is either non-existent or misleading. Most tracking tools simply attribute offline campaigns to “direct” traffic, which doesn’t really tell you much about the audience. Campaign-specific URLs: The easiest solution is to simply use a campaign-specific URL in your offline ads (such as “MyWebsite.com/Campaign-Name”). Anyone who visits this specific URL can be assumed to have come through the campaign. Time-limited attribution: In this approach, the campaign gets credit for any spike in direct traffic within days of the campaign. Surveys: The easiest way to figure out where your traffic is coming from is to simply ask them. You can extrapolate data from a small number of respondents to estimate the impact of the campaign. As you can see, all these approaches have issues. Campaign-specific URLs don’t factor in people who just type in your main URL. TIme-limited attribution doesn’t factor in people who see the ad later. And surveys have notoriously poor completion rates. You have to factor these into your attribution models. Even the most carefully planned model will run into some attribution issues. Marketers will often say that the most important parts of any marketing funnel are the first and last touch points. After all, this is where the lead first enters the system and where it turns into a sale (or an MQL). The popular U-shaped model assumes the primacy of the first/last touches and assigns them 40% credit each. The remaining 20% credit is evenly distributed across all the middle-of-the-funnel touchpoints. Although it’s an improvement over the standard last/first-touch model, it assumes that every business operates the same way. What if one business focuses heavily on branding while another optimizes for decision-stage PPC? Standard attribution models also ignore the increasingly personal nature of customer journeys. One customer might depend exclusively on search to find your business. Another might distribute his attention over search, social, and even offline ads. This approach works well in the fragmented, personalized nature of modern marketing. It also keeps pace with the complexity of your campaigns. If you’re personalizing creatives or marketing spend based on each lead’s past behavior, algorithmic attribution will help you distribute credit for it effectively. There is no “one-size-fits-all” when it comes to attribution models. This is particularly true for agencies since you’ll be working with a range of clients. Number of touchpoints: The higher the number of touchpoints in the sales cycle, the more nuanced the attribution model must be. For campaigns with limited touchpoints between lead to conversion (such as a PPC campaign), a simple last/first-touch model can work well enough. Sales cycle length: Longer sales cycles require attribution models that work throughout the length of the cycle. First-touch attribution often fails in such situations since the tracking cookie has a limited lifespan. A time-delay model works far better since it can account for the gradual increase in interest over the cycle. Target channel: If you’re focusing on a specific channel (such as SEO), you can ignore multi-touch attribution. Instead, pick a “last [channel]-touch” attribution model so you can prove ROI for your marketing efforts. Your goals: What attribution model you choose should depend on what you’re trying to measure. If your goal is to generate demand, a first-touch model would be more than enough. If it’s measuring conversions, a last-touch model would work well. Consider a comprehensive multi-touch model only if your goal is to measure the success of the entire marketing funnel. Keep in mind that every marketing attribution model has its flaws. You have to sprinkle a dash of salt on any data you get from your model. It can tell you what’s working, but not with 100% accuracy. 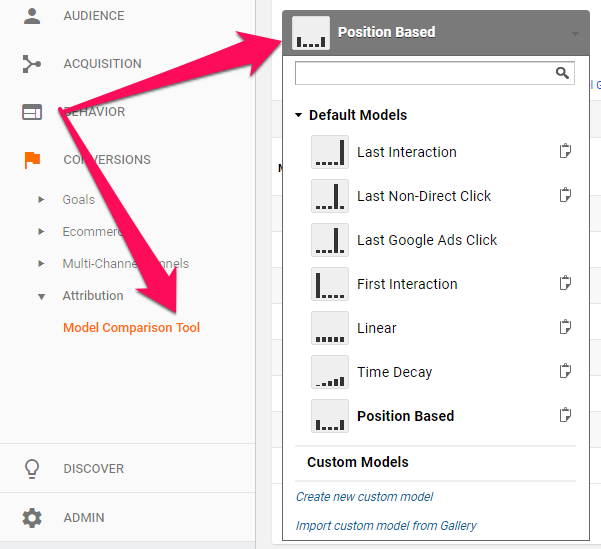 What marketing attribution models do you use in your business? Share your thoughts in the comments below!